Long established Vanuatu tour business for sale. The business operates 3 vessels undertaking various water based tours, all with cruise ship contracts and strong relationships with all major resorts and tour wholesalers. A semi-sub and is the only one of its type in Port Vila that does reef viewing and snorkeling tours. The Coral Explorer does high speed snorkeling tours and Port Vila Parasailing is the only parasail operation in Vanuatu. This is a genuine sale as the owner has other business interests overseas and cannot give this business the time and attention it deserves. Can be run under management with fantastic long term staff but would also suit owner operators. 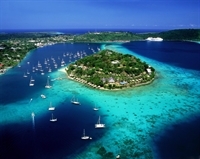 Vanuatu has over 120 cruise ships visit per year. Vendor will consider all genuine offers. Downtown Port Vila on the waterfront. The owner has other business interests overseas and cannot give this business the time and attention it deserves.